You’ve already decided that you and your family can benefit from a housecleaning company. But now, it’s time to do the work in deciding on a company to use. When choosing a housecleaning service to clean your home, one of the biggest questions is, what will my maid service clean? It is important to know upfront what your Professional Housecleaners will clean so you know what to expect and you find a service that is fitting your needs. Plus, you want to make sure you aren’t getting ripped off and that you are paying the proper price for the work being done. 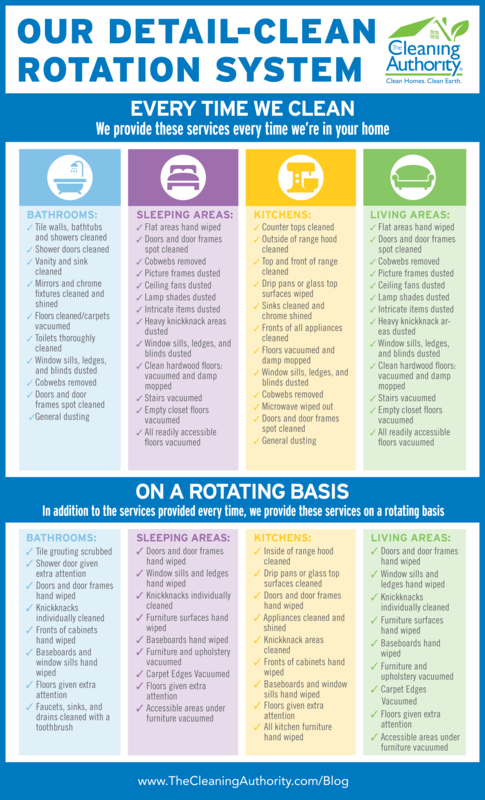 At The Cleaning Authority, we use our Detail-Clean Rotation System to ensure that our customers are always receiving a high quality clean. Additionally, our Professional House Cleaning Checklist is used to make sure our customers get a thorough clean every time and that nothing is missed. Check out the list below of everything we clean at The Cleaning Authority, and visit us today for an online estimate.